Almost every pro sports franchise has their own mascot, and mascots have become as exciting as sporting events themselves. In fact, mascots are so popular with fans that the Mascot Hall of Fame opened in Whiting, Indiana in 2018, giving fans of all sports the chance to vote annually for their favorite pro mascots to become members of the hall. Although your home team’s mascot is likely already your favorite, there are plenty of teams with crazy, lovable, and outright silly mascots. Here are seven of the very best mascots in any game. The Phillie Phanatic is one of the most beloved sports mascots of all time because he’s just so ridiculous. According to Philadelphia Phillies legend¹, the Phillie Phanatic is “a huge, green, flightless bird from the Galapagos” who fell in love with baseball and became the mascot for the Phillies in 1977. 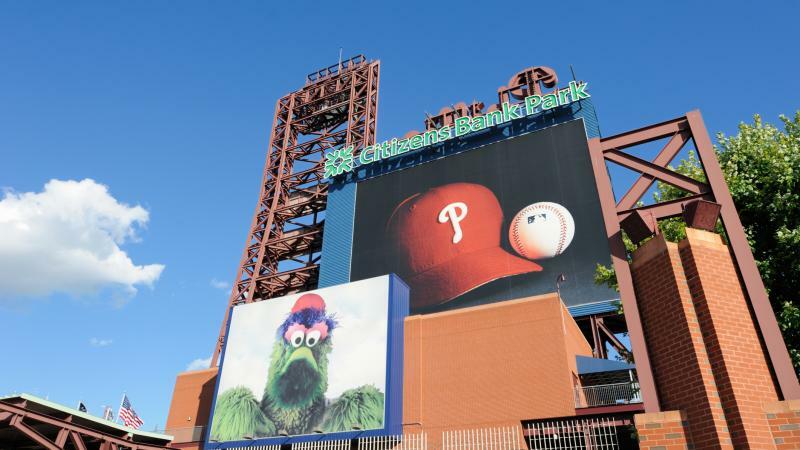 But Phillie didn’t just show up one day – he was carefully planned to attract families to the stadium. The costume was inspired by The Muppets to make this mascot especially interesting to kids. Another Mascot Hall of Famer is the San Diego Chicken, also called The Famous Chicken. This mascot, a gigantic red chicken with a yellow face and blue comb, actually started as a character in a TV commercial. The Famous Chicken’s perfomer², Ted Giannoulas, loved baseball, so he asked the San Diego Padres’ front office if he could volunteer to work the stands and get fans excited at their games. The Chicken became a popular draw, and attendance at Padres’ games increased. One of the newest mascots on the pro sports scene is the Philadelphia Flyers mascot, Gritty. Like the other Philly mascot Phillie Phanatic, Gritty is an absurd-looking creature with shaggy orange hair and googly eyes. When Gritty was unveiled, he set off a social media storm – but many people thought he was terrifying. According to his official biography³, Gritty is a subterranean creature that had been living under the Wells Fargo Center until construction forced him to abandon his home. He loves hotdogs, and eating snow straight out of the Zamboni machine. One of the oldest professional mascots out there is Mr. Met, the New York Mets mascot since 1963⁴. His costume is essentially just a gigantic baseball head – the rest of his shape is the performer’s body with padded hands. Mr. Met is believed to be the first pro mascot based on a human rather than an animal. He spent several years as a popular fixture of Mets games, but was retired after just a few years on the field. Continual pleas from fans brought the mascot back in 1994, and he’s been accompanied by his wife, Mrs. Met more recently. The 37.2-foot high left field wall of Fenway Stadium has long held the nickname “the Green Monster,” so it only makes sense that the Red Sox’s mascot would be named Wally the Green Monster in its honor. According to Wally’s official biography⁵, he’s been living inside the Green Monster since 1947, and loves to watch the game from a conveniently-placed peephole. Wally’s first appearance at Fenway was in 1997, and he was an immediate hit with younger fans. One of the most athletic mascots around is the Phoenix Suns Gorilla, whose identity is a tribute to Phoenix fans tendency to “go ape”. He was actually adopted by the Suns by accident; according to his story, a singing telegram service⁶ sent a messenger in a gorilla costume to deliver a singing telegram to Veterans Memorial Coliseum, and a security guard jokingly suggested that the messenger do a few dances beside the court before leaving. It was such a hit with fans that he was invited to become a part of the team. Benny the Bull is the Chicago Bulls mascot, although there’s been quite a collection of Bull Family members who have appeared on the court since the Bull debuted in 1969. The current Benny the Bull⁷ was introduced in 2004 after the 1990s-era mascot called Da Bull was removed. Benny does flips, jumps, and can even dunk the ball. He’s gotten himself a huge fan following after several of his hilarious stunts went viral.